You: It’s on me today. Friend: No, you don’t need to do this. Let’s split the bill. How would you say this in Portuguese? Let me show you the best way to do it. Let’s see how the dialogue above would go in Portuguese. It will be useful when you are meeting Brazilian friends. You: Hoje é por minha conta. Friend: Não, não precisa. Vamos dividir a conta. You: Não; eu faço questão. The phrase is: ser por conta. Below are additional examples using the phrase ser por conta with different conjugations. Notice that you need the preposition de, or one of its contractions, after the phrase and before the person who is paying for it. Mila: A gente vai comemorar o aniversário da minha mãe num hotel fantástico em Porto de Galinhas. Vai a família toda. Rosa: Vai ser caro! E você está lisa. Mila: Vai ser tudo por conta do meu pai. Mila: We’re going to celebrate my mom’s birthday in a fantastic hotel in Porto de Galinhas. The whole family is coming. Rosa: It will be expensive! And you are broke. Mila: It will be on my dad. Clóvis: Esse restaurante é super famoso. Vou aproveitar para tomar um bom vinho já que é por conta da empresa. Clóvis: This restaurant is very famous. I will take the opportunity to have a good wine since it is on the company. Learn the present tense of the verb Ser with our free flashcard app for Android devices. This is how you say “I insist” in situations in which someone insists on doing something for someone else. Cris: Os pais da Mila são muito animados. Eles sempre fazem questão de juntar os amigos e a família para celebrar datas especiais. Cris: Mila’s parents are a lot of fun. They always insist on getting friends and family together to celebrate special dates. Clara: Como você voltou pra casa ontem? Bianca: O João fez questão de me dar uma carona. Clara: How did you go home yesterday? Bianca: João insisted on giving me a ride. Learn the present and past tenses of the verb Fazer with our flashcard app for Android devices. Do you have a module on “dar uma carona”? I have never heard this expression and would love to learn more about it. Is it something that people in Rio say? Or is more of an expression elsewhere? Thank you for the lesson on the questions above. I had no idea and really enjoyed learning about how to say “It’s on me” and so on. You explain things so well in English – it’s fool-proof for people like me! Hello Luciana, I have tried Rosetta Stone, Pimsler and Duo Lingo but it is hard to remember what I learn. 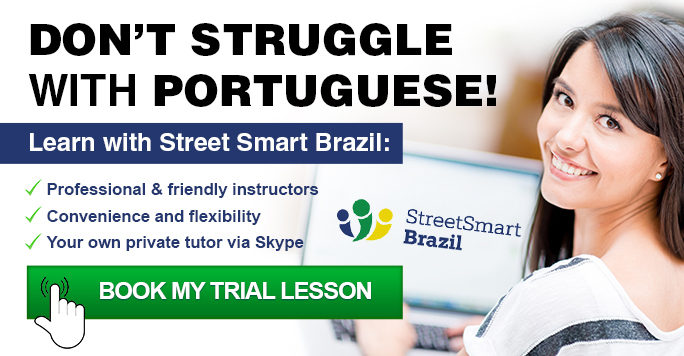 I have a friend coming from Brasil in July and I would like to impress her with my knowledge of Portuguese. Could you help? Yes, we can help you! I myself am not a good language learner with apps and CDs, all by myself. It is a different experience when you practice with a trained instructor who can give you relevant, timely feedback.